Mark devoured this soup. I’m lucky I got a bowl of it before he come in from the snow storm. An entire post of this soup, an entire pot he devoured! This soup is hearty and delicious. And it’s fast and easy to make! 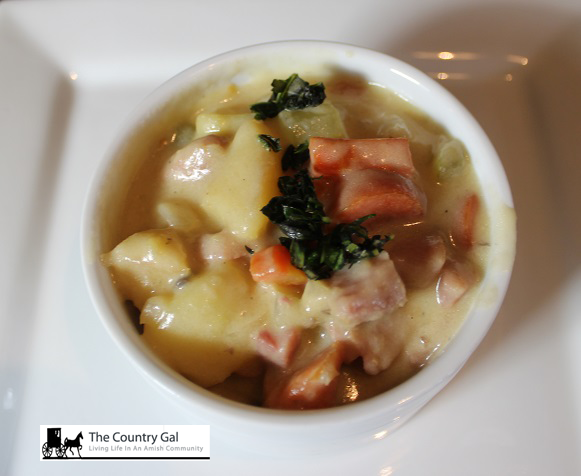 This hearty soup goes fabulous with our Amish White Bread or our Amish Wheat Bread TOO! Simply add 2 tablespoons of butter in a nice non-stick frying pan. Let them get brown and crispy. When the potatoes look an nice and golden toss them in a big pot. 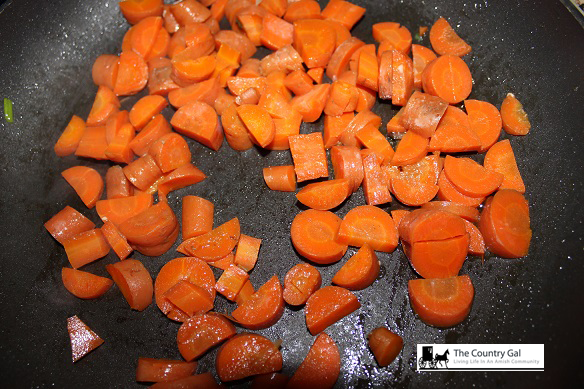 Then put the carrots in the pan with a dash more butter. When the carrots are tender, toss them in the pot with the potatoes. 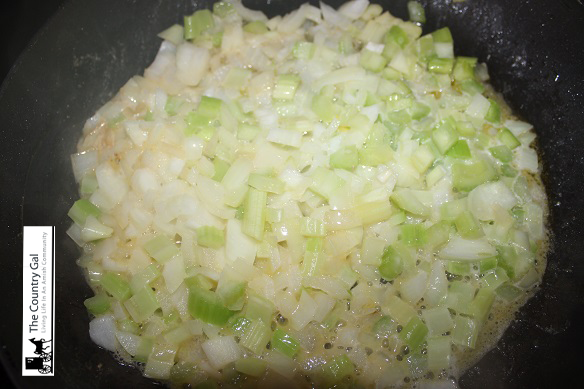 Then toss the onions and celery in the frying pan with a bit more butter. 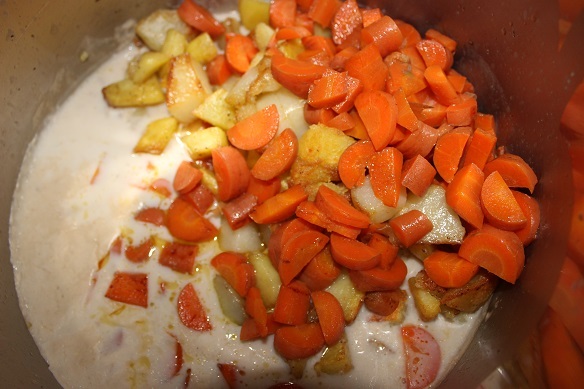 Cook until tender and then toss in with the carrots and potatoes. In your big pan, the one with all the nice veggies, add your beef broth, cream of mushroom soup, water and milk. Finally add the cooked ham. Cook on low for about 20 minutes and then hide some for yourself if you have a man in the house! 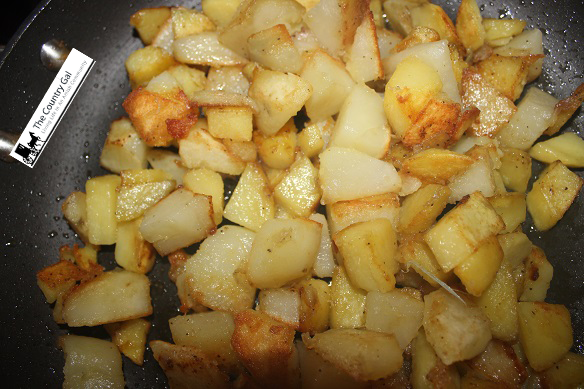 In a frying pan add 2 tablespoons of butter and potatoes. Fried until golden brown. Remove and toss in the carrots, add butter as needed. Cook the carrots until tender. Remove the carrots when done and toss in the celery and onion. Add additional butter if needed. Cook until celery and carrots are tender. In a large soup pan stir in the beef broth, water, milk and cream of mushroom soup. Toss in the cooked veggies and ham. Cook for 20 minutes and serve. Enjoy! Wow! this looks really yummy! I’m definitely going to make this on one of our cold nights. Love this pics too so bright and crisp! Now, I’m hungry! Thanks for the recipe. Definitely a great comfort food. Looks delicious! I want to eat it right off my screen. Can i place an order to be delivered next Tuesday please?? Oh my yum! This looks delish and warm! 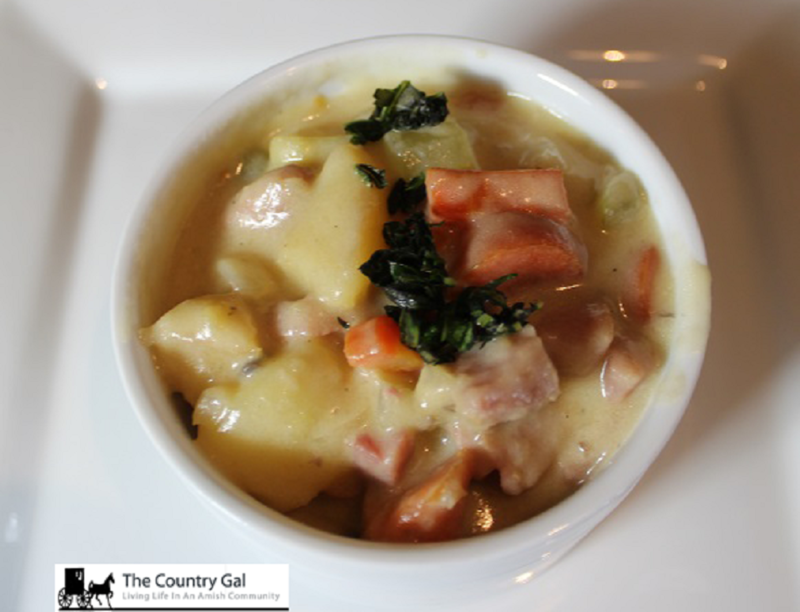 It’s 1º here today so warm soup is a great idea. Soup in this winter and that too ham with potato is like wish come true. Will not wait for her to be back home, now I have recipe to do my self. Thanks a ton. 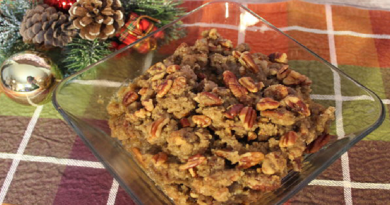 This looks so warm and hearty, I know my family would love to try it! It looks easy to make too! I don’t personally care for ham. My husband loves it though. I bet he would love this! You and I are clearly on the same page with what we want to be eating these days! 🙂 Starting with those roasted potatoes sounds unbelievably good! Wow. This looks so simple and delicios. I want to try it right now. I’m definitely going to have to bookmark it later. Thank you for sharing. This sounds delicious! Perfect for the winter weather we are having right now! That looks so good. I just saved it to find again later. I need lots of easy recipes. YUM! That looks fantastic. I absolutely love soups especially hearty soups. I have a pretty killer recipe for ham and potato, but maybe next time I’ll be inspired to give yours a go. ps…how do you get those nutrition facts? It is FREEZING HERE!!!! I want to jump in this bowl!! Thanks for sharing! I am super excited right now to read this recipe! It is sub zero temps outside and what a treat to make homemade soup for my 3 children. I may have these ingredients already at my house too! I have never thought about actually sauteing the ingredients before cooking them! Yum! And I actually have everything on hand right now to make this for dinner, so guess what is now going to be cooking? Perfect for a crazy cold day in Sw MN! This looks very good! I’d take out the onion chunks and just use onion powder, but I have texture issues and onions are one of those things I can’t handle. But I do love onion powder! I wonder how this would taste with sausage instead of ham? Thank you for this recipe. It look simple to make & so delish! I need to go to the store to get ham but everything else I have. 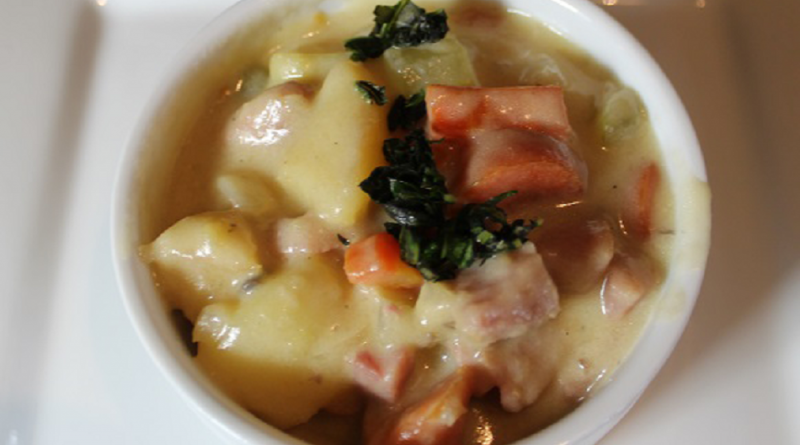 A cold day like today is good for a hearty soup! Looks so yummy! I wish have to pin this and try it later. Everyone is making all this yummy soup that is fitting for their side of the country. LOL it’s so freaking hot in Arizona, I wish I could enjoy a nice bowl of hearty soup. This sounds so good! Unfortunately I’d have to leave out the carrots. My dad will not eat those for anything. It’s a shame too as I love carrots and so do my three younger children. My two older ones like theirs raw. WOW that soup looks delicious. 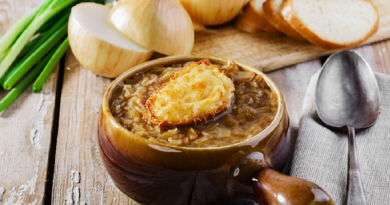 I really enjoy soups during the winter, especially the ones that are easy to make. potatoes must be a cold weather thing to fix food wise. This is the second potato and ham soup recipe i’ve seen today online. This looks good too. Wow! That’s a LOT of butter. My kind of recipe! =D Thanks for this. Will definitely try it out this week! Looks very good. It’s cold and snowy here in Colorado. 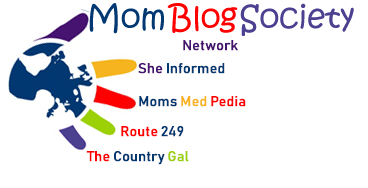 Love your blog, it’s really sharp. Wow this looks very yummy.. I am definitely going to try this one..
Ooh! Yum! This looks really filling yet healthy! Making my mouth water! Tells you how much I love soup! 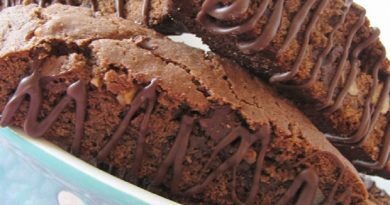 This looks so decadent and sounds so good! I got so excited to Pin it I almost forgot to come back and comment! oh, that looks so good! so creamy and meaty….yummy! I would love to try this recipe. LOL! Thanks for giving me an idea. It is really easy to make and very healthy with all the veggies involved. It looks great, and I am planning to make it later this week. How much ham do you put in? I didn’t see it in the recipe. Thanks for pointing that out Margot! I added it to the recipe. 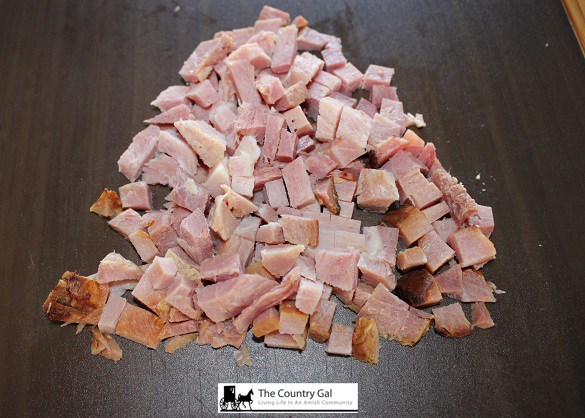 1 cup cooked ham. I love soup of all kinds … and this one sounds delish! Looks fantastic. I like soups that are thick and chunky.